After Labor Day and the unofficial end of summer arrives, fall beckons with promise. With summer memories still fresh in mind, autumn entices with its own distinct palette of activities and colors. Summer offers much anticipated visits to exotic locales and exciting, far flung locations. Its attraction lies in relaxation. Of mind, and of body. Casualness is its mantra. Days pass with languor. As you bask in the warm sun, your silhouette relaxes as well. Clothing is spare or loose and flowing. Minimal effort is rewarded. Summer has its undeniable and simple charms. And yet, it is autumn that excites me. Autumn is interactive and communal. Its pleasures are immediate. Its beauty lies in remaining closer to home. Invitations for dinner, drinks, gallery openings, art exhibitions, business seminars and charity galas fill your inbox. Each event is an opportunity to reconnect with friends and associates. Each one provides grounds for learning, and for sharing and celebrating what has been learned. Each is a welcome challenge to step up your game, mentally and sartorially. Fall’s discussions are stimulating, and its conversations ripe with reflection. Remembrances of travel and moments experienced flavor every discourse. Words flow meaningfully and long simmering thoughts become actionable ideas. Somehow, your perspective seems clearer and more sanguine. And maybe it is... You are more attuned to the beautiful details of everyday life that are lost in summer’s glare. In fall fashions, visual and tactile sensations are heightened. Creamy expanses of suede dissolve into undulating layers of fringe and tassels. Denim stands at attention, darkened, and crisp. Patent leather winks with shine and decorative perforations. At this time of year, textures and materials are also combined for maximum interest. Structured leather jackets open to reveal silky satin blouses. A cozy cashmere wrap is enlivened by the brilliant sparkle of an unexpectedly placed heirloom. The rhythmic weave of a sweater sleeve ends in the flourish of a conversation-starting cocktail ring. Now, as the weather slowly begins to cool, summer’s bright colors give way to the more nuanced shades of autumn. The eye eagerly adjusts to the richer hues the season offers. Neutral white morphs into a blush pink, then a deep bordeaux. Sunny yellow becomes a burnished orange, mellowed with time. Blue runs the gamut from the softest cerulean to the most commanding of cobalt. Purples follow lead of the amethyst spectrum. Fuchsia surprises in quick bursts- on eye catching jewelry or the petal of a late blooming flower. Chocolate brown is overlaid with caramel, and given definition with inky indigo. Juxtaposition rules in fashion as in nature. 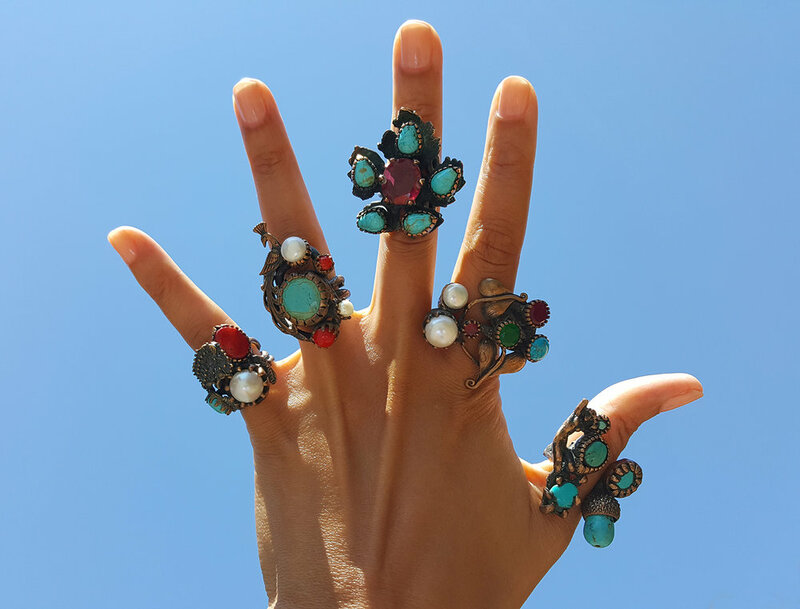 The sculptural qualities of bronze are underscored by pops of turquoise, whether in a statement ring or in the branches of a tree, framed by the September sky. Coral makes a noted reappearance; in autumn, accented with pearl, it retains its individuality, but is polished, regal. The breadth and bounty of fall’s harvest is echoed in the ample use of berried tones and is highlighted by emerald green, teal and gilded surfaces. From its very start, fall is alive with the appreciation of life well enjoyed. Fall? I’m ready. Bring it ON.